Maintaining healthy feet is vital if you’re seeking to enhance your overall health. For this reason, it’s important that you get yourself a good set of toenail clippers to help you keep your feet neat. So are you looking for the best toenail clippers for your feet? Below are the top five options you may want to consider. Tweezerman is one of the most popular brands today whose main selling point is its high-quality design. Indeed, it is the bestselling clipper on our list. Tweezerman is made from stainless steel that makes it exceptionally sturdy. Besides, it comes with very sharp blades that hardly leave any loose edges. It also has a straight edged finish that helps you prevent ingrown toenail quite easily. Blades do not open wide enough and may, therefore, be unsuitable for people with large or thick toenails. Featuring very sharp blades, the Candure Spring Angled Clippers may just be your ideal toenail clippers if you have hard, thick nails. The clippers are quite sturdy and are made of high-quality materials. However, some people may find them a bit stiff and thus difficult to use. It’s, however, important to mention that these clippers are mainly meant for podiatry functions which is perhaps the reason they are quite stiffer. The Seki Edge Toenail Clippers are made with durability in mind albeit at a cost. The set makes our favourite high-end clippers. Among the notable features you’ll love about these clippers include the inclusion of a nail catcher that helps to trap your clipped nails. The clipper also comes with very sharp blades and a wide jaw that will easily fit any regular nail. If you’re looking for a pair of clippers that are easy to use and are also great for thick nails, then the Mehaz Professional Toenail Clippers may just be your ideal option. One of their outstanding features is the very wide jaw that fits virtually any nail regardless of its thickness. Besides, it features an angled head which makes it easy to prevent ingrown toenails. The sturdy design, firm grip and simplicity make it great toenail clippers for the elderly. Looking for a budget set of large toenail clippers that gets your job done properly? Go for the Elegant Touch Toe Nail Clippers. These clippers come with very sharp blades and are large enough for use by people with big toenails. However, their levers have an ergonomic curve which makes it a bit difficult to maintain a good grip while holding it. An excellent toenail clipper should be easy to use when clipping either big or small toenails. Besides, it should be easy to angle to allow you see where the nail is being cut. More importantly, it should offer a good grip and cut nails seamlessly without having to apply too much pressure. Is the clipper able to catch any clipped nails? Does the clipper leave any rough edges? Is it able to cut well through the hard and thick nails? It’s important to look for a nail clipper that fits your budget. The prices of the five clippers reviewed above range from £1.50 to £15. Trimming your toenails regularly can help prevent a build-up of bacteria and debris underneath the nail which can lead to fungal infections. Long nails can cause injuries to your toes due to the friction and pressure they place on them when wearing closed shoes. Regular trimming of toenails is an excellent way of minimising instances of foot infections and odours. Short, well-trimmed nails help you appear neater and more presentable even when wearing open shoes. 1. Should I get curved or straight toenail clippers? Straight clippers are the best and safest, even for people with curved nails. Curved clippers can hurt your cuticle, cause nail breakage at the edges and can lead to ingrown toenails. 2. Which is the best material for toenail clippers? Stainless steel is the best. Stainless steel clippers are more expensive but they are stronger, clip better (and safer) and retain their sharpness for years. 3. Can I use my toenail clippers on my fingernails? Yes, you can. A good pair of toenail clippers should cut your fingernails just as well. But if you have clippers designed specifically for fingernails, it’s not a good idea to use them on your toenails. That’s because they are likely smaller and weaker than standard toenail clippers. They won’t work properly on your toenails and can even damage your nails. If you want clippers you can use on all nails, get toenail clippers. What ever is sharp and can get through some thick nails is what I am looking for. All of these seem like they would get the job done. 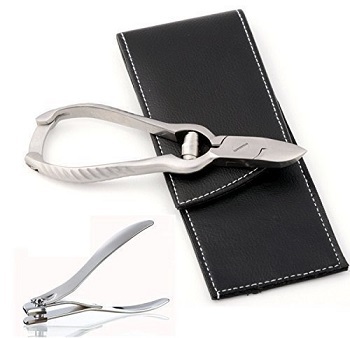 Nail Straight Scissors, Nail Curved Scissors, Cuticle Scissors, Toenail Scissors, House Hold Scissors, Tailor Scissors, Professional Hair Dressing Scissors & Thinning Shears, Fancy Scissors, Barber Scissors & Thinning Shears, Cuticle Nail Nippers, Nail Cutters, Toenail Pliers, Nail files all kind tweezers etc. GHANISTAR INTERNATIONAL is a leading Beauty care instruments manufacturer & exporter company in sialkot. We produce beauty care instruments according to international quality standard. We have latest manufacturing latest machineries. We have experienced workers in our manufacturing unite. They have ability to make any beauty care instruments according to your special design and required sizes. we shall provide you all your required BEAUTY CARE instruments in very high quality with afford able prices. We assure on time delivery for all the all the shipments. In order to achieve this GHANISTAR INTERNATIONAL developed contractual relationships with different freighters and forwards to get privileged services for our clients. We can provide you door to door delivery through our well established and best serving forwarding system.